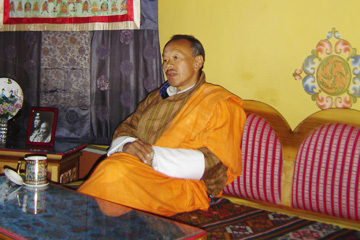 Lyonpo Jigmi Thinley, minister of home affairs for Bhutan, speaks to visitors in his office in Thimphu, the capital city. The tiny country of Bhutan in the Himalayas and the Honolulu Academy of Arts are working together on an exhibit of religious treasures from Buddhist fortress-temples called "dzongs" that will premiere in Hawaii. Bhutan is located just below Tibet between India and China and is primarily Buddhist. The nation of about 700,000 people is ruled by a king, who is proposing a new constitution to abdicate power and bring parliamentary democracy to Bhutan. Hawaii's connection with the religious and artistic treasures in Bhutan's dzongs started with a visit to the country by Ephraim Jose, the Asian-paintings conservator at the Academy of Arts. Jose said after visiting the dzongs, he began working with the government and religious leaders to help them preserve the religious artworks stored there. He and other preservationists from Hawaii, often at their own expense, have been making yearly trips to Bhutan, high in the Himalayas, to teach the monks in the dzongs how to better care for and preserve the artifacts. That has led to a $2 million exhibit called "Dragon's Gift" of the religious artworks and Bhutanese culture and dances, which will premiere in Honolulu in 2008 before traveling to San Francisco, South Korea, Japan and possibly Washington, D.C., and New York. Most of the items are sculptures and religious paintings called "thankas" and have never been out of the country. Some are locked in vaults and are rarely displayed even in Bhutan, Jose said. The home and cultural minister of Bhutan, Lyonpo Jigmi Thinley, was in Honolulu last week to work on arrangements for the exhibit. While here he also gave a talk on the country's development philosophy of "Gross National Happiness," which suggests that government should be more concerned with the happiness of its people than pursuit of consumer goods and measurements of gross national product. "There is a growing interest in how to be happy as opposed to how to make money," he said. Happiness is hard to measure, Thinley admitted, but the government has assigned its top scholars to try to come up with ways to quantify it. "We in Bhutan do not dismiss happiness as a utopian concept," he said. In the meantime, the government's policy of GNH is based on promoting sustainable development, preserving culture, environmental conservation and good governance. Bhutan requires that at least 65 percent of the land remain forested because a clean and pristine environment is important to happiness, Thinley said. The government also actively encourages preservation of its culture. Television and the Internet were only recently allowed in Bhutan, and some aspects of them remain controversial. The government also limits tourism to what it believes is a sustainable level. Bhutan is not perfect, Thinley said. Most of its residents live at a substance level, but the country is trying to balance economic development with the impact on its citizens. Among those attending the speech were former Lt. Gov. Mazie Hirono, state Sen. Norman Sakamoto and Kauai County Councilwoman JoAnn Yukimura. After the speech, Thinley said Nepal and Bhutan are continuing to trying to find a solution to the fate of about 100,000 Nepali-speaking refugees, some of whom left southern Bhutan during the early 1990s during a period of political unrest. Many of the refugees are trying to return to Bhutan and have been living in United Nations camps in Nepal since they left. Asked how Gross National Happiness relates to the refugees, Thinley said every country needs to control its borders from illegal immigration. "There is such a thing as capacity," he said.